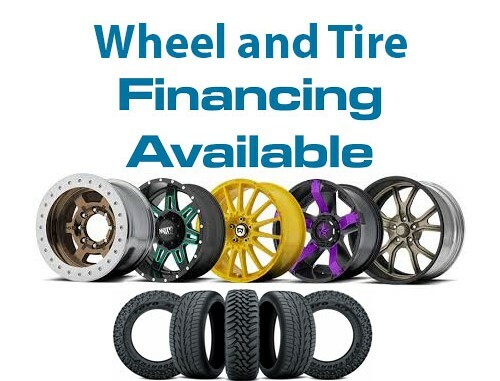 We can help you get financing for a set of custom rims and tires. 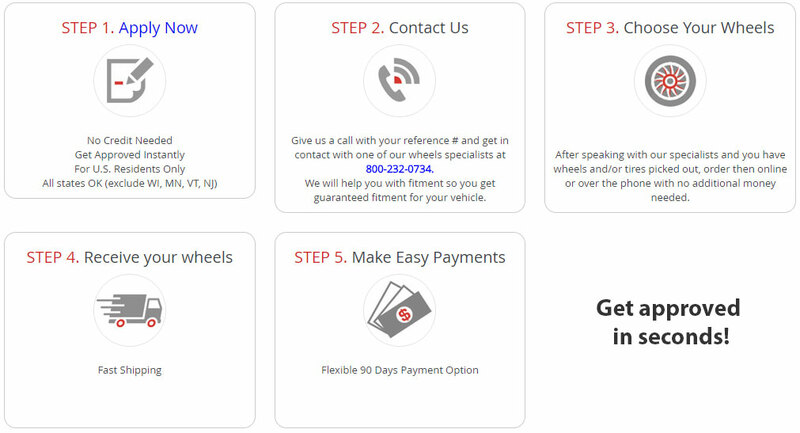 Get approved in seconds with no credit and start shopping for your wheel & tire package. Custom wheels and tires are is the easiest and most aesthetically pleasing upgrade you can do for your car, truck, Jeep or SUV. Putting wheels on doesn’t require permanent manipulation of your vehicle. It’s as easy as bolting on your new rims and tires and completely changing the look of your ride. Every time you see your vehicle you will appreciate it that much more and just enjoy the look of your vehicle that much more. We have over 35 warehouses located across the country that we ship out of. That means you get your wheels in the fastest amount of time possible. We have well over 100,000 wheels and tires in inventory and ready for you to put on your vehicle. We also have wheel and tire experts waiting to help you out with ANY questions you might have. Give us a call 800-232-0734 during our business hours which are Mon-Fri 8:30am-6pm EST and Saturday 9am-4pm EST. We can help with any type of fitment questions you might have so you know you are getting exactly what you want. We also have a guaranteed fitment or your money back. That’s right, if you order online on our web site or if you talk to one of our wheel and tire experts, we will double and triple check to make sure you get the correct fitment for your vehicle so you can rest easy at night. Applying for wheel and tire financing is easy! Contact us – Once approved (only takes seconds), contact us with your reference number. Your wheels and(or) tires will be shipped right to your front door for FREE.